Rob Enslin | Comments and thoughts from around the web. Comments and thoughts from around the web. Over the last three months I’ve been working on a very exciting (and challenging) project as the sole UX person. The start-up product we’re designing targets a niche market sector. Our product team is made up of a representative from marketing, operations, development (3), management (and the product owner) and user experience design (me). And while our full time developers meticulously sew the pieces together I find myself running around fulfilling various other non-factored roles as well as assisting our team’s roles too. Don’t get me wrong it’s pretty exciting and fun with huge rewards, but there are times when I feel I’m straying off the UX track and neglecting my core responsibility. I’ve noticed this especially when I stumble on elements of the design I’ve not been party to. And, it’s no one to blame, we all have tight deadlines and need to get on with our tasks, certainly during this phase of rapid development. 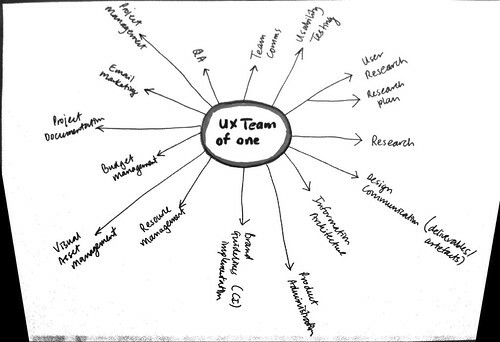 Whilst most functions are covered by our team roles my UX role is spread too thin. I’m being pulled in many different directions and in equal strengths of importance. Prioritising is extremely difficult. For those who have worked in a fast-paced start-up environment know it’s chaotic, but we do our best, and just get on with it… the product needs to get to the market, right? Everything seems to be important and everything needs to be done now (yesterday actually). 6. Use role blurring to learn how business and developer folk think and ask tons of questions. 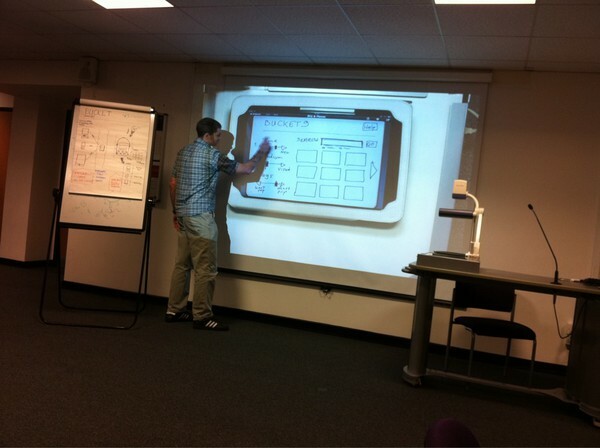 I was lucky enough to be part of the first London Design Jam which took place at London City University, London. Like locally organised Barcamps Design Jam’s structure followed a similar format. The doors opened at 8.30am where the attendees were greeted to excited faces with a sense of curious anticipation. Organisers, Johanna, Dees, Joe, and Franco, had done well to plan and prepare the event in such a short time. For once I decided not to let technology distract me from mixing and collaborating so I kept my laptop and phone out of sight for the most part. I wanted to fully immerse myself within the team. Design Jam followed a basic theme: Bring a bunch of user experience geeks together to design a solution (to a problem) by sharing skills and knowledge through collaboration. So after writing our names (as well as skills and expectations) down on index cards and placing them on a group wall, we gathered for the day’s briefing. Our team (Bucket9) was made up of: me, Makayla, Ana, Sjors and Helena. 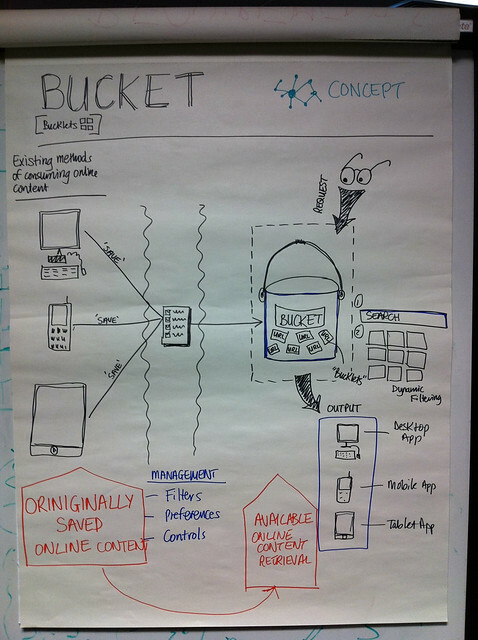 What is the ideal interface to keep track of previously viewed online content, across multiple devices and locations? Nowadays many of us consume online content using various output devices and in many different contexts (on the go, in the office, commuting, etc.). Often we mark this content in some way to read it later, share it or keep a permanent record of it, mostly through bookmarking, to recall it. Retrieving that content can be difficult or clumsy so by looking at a specific user’s needs we might design a solution that eases that pain. The question we attempted to answer was how could we make that experience easier, more effective and fun? 1. Brainstorm – thoughts, current methods and applications available, what works and what doesn’t. Gather our collective thoughts and create an affinity wall. 2. User research – from online research we sought quantitative data looking at what currently exists, what is popular and what percentage of the user population engages in these products. Furthermore, a short qualitative study, interviewing users (attendees at the Design Jam) on what devices are being used to mark content and how they retrieve that content later. With more time we should have looked deeper to reveal specific problem areas. This became evident when we started designing our solution, as Leisa quite rightly points out in her post, ‘Designing at speed – DesignJam1‘. Leisa reiterates how important it is to focus on a specific problem and design a solution on that. Our product, Bucket. What is it? It’s simply repository where all previously consumed online content is stored and managed so users have the ability to recall and retrieve that information in a quick painless manner, that’s potentially immersive in its nature. 4. Problem and scope definition – identifying the problems and deciding which of them we tackle based on the time allocation. 5. Divergent and convergent wireframing – individually break out for 15mins to sketch as many ideas for the design of the UI and elements of it. Then reconvene to discuss our individual ideas, collaborate to determine the best possible solution(s) to move forward. Finally, wireframe our ‘ideal solution’ and then refine it, iterate it as necessary… or until the artefact communicates its purpose. 6. Presentation of solution – prepare the artefacts into a coherent story and test amongst the team. Final thoughts for the day. While the process of designing a solution is far from ideal, using the Design Jam format, I think you get out of it what you want, and of course what you put in. I focused less on the quality of the design process and more on work pace and collaboration, where rapid design is required. That said, for future events the organisers of Design Jam could focus on specific aspects of the UX design process, e.g., user research and modelling, concept creation, communication and output. I recently changed jobs and now work as a User Experience Consultant at Interaction Design Studio. Since starting I’ve been doing a lot of work conducting heuristic evaluations (HE). Just to recap, a HE is an inspection method or review conducted by a usability expert, of a website which complies to widely accepted (and even adopted) design principles. These design principles (called heuristics) are what is considered standard practice or rather best practice. For example, when submitting form data the system should inform the visitor that ‘something’ is happening – processing, validating, checking, submitting – something that keeps the visitor informed. An ‘official’ widely used set of heuristics are Jakob Nielsen‘s ‘Ten Usability Heuristics‘. A practitioner involved in the field of user experience conducting HEs is an essential skill and dare say one that should be mastered. Having the ability to pick apart a website and analyse its strengths and weaknesses has many benefits, notwithstanding cost-benefits and speed to conduct. Often the findings provide insights which allow website owners to fix the quick and easy issues, the low hanging fruit fixes. In most instances conducting a HE serves to highlight potential flaws and usability failings, but also suggest or recommend ways to fix or correct the issues. I’ve been reviewing and reading HEs conducted by other practitioners. I find it kind of interesting to read their assessments. Often they spot issues which I may have missed, or articulate the problems differently. Reviewing HEs is also a good way off checking work too, making sure there are no errors, and of course it acts as a second pair of eyes strengthening the assessment process. But, are we writing these reviews with the end-user in mind? Are we using technical terms with explanations? 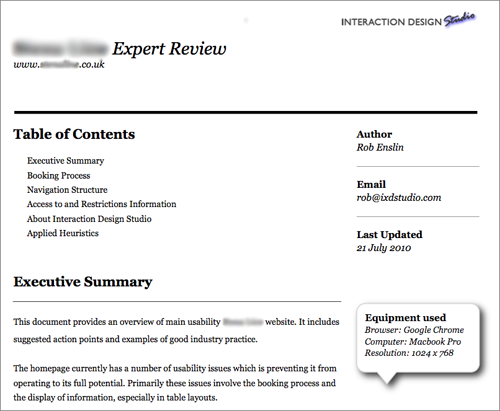 Quite often the reviews I write are written for business managers, website owners and marketers, and not user experience or usability professionals. So should we place more emphasis (on our writing) on our clients? Perhaps we should be writing both a technical and a normalised version? Or should we be documenting our findings providing explanations for technical terms which seem impossible to omit? My view is that prior to writing a HE be clear about who its recipient is. All HEs or expert reviews should be written in normalised language and where unavoidable provide explanations for technical terms. Many of us working in the corporate world operate two mobile devices. In many instances the reason is primarily because the company has a corporate deal which involves an email exchange server and an associated Blackberry device policy. At the same time people have an additional smart phone for private use, like an iPhone. I know I do. It’s widely accepted that certain functions work on some mobile phones but not on others and that operating those functions, like text documents, on different devices culminates in a better user experience. For example, trying to create and edit a document using an iPhone is seemingly easier than say the Blackberry (that does not include the manual operators, it’s the applications functioning). During a recent usability test (testing a news wire iPhone app) I discovered that the participant did exactly as I do. 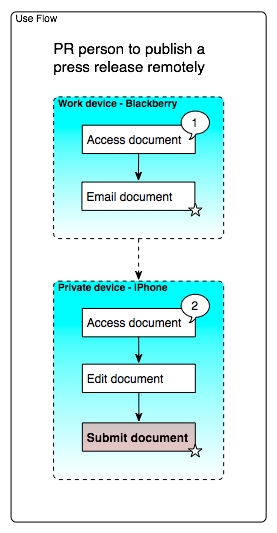 When I asked how they would edit and send a document (press release) from their device they said they’d email the document from their work mobile device (the Blackberry) to their private mobile device (the iPhone) first, then edit the document on their iPhone before sending. What contextualised findings have I learnt from the empirical usability test? Well, other than the specific functional insights originally set out, a) the only way to access work files is through the work device and therefore only good for emailing out* and b) workers are very good at finding alternative ways, albeit unconventional or perhaps inefficient, to complete tasks. I attended Agile UX SIG #2 last night at the ThoughtWorks where agile geeks met to discuss the much hyped Agile methodology. While I’m curious about all the fuss I’m also professionally interested to learn how Agile might improve workflow. 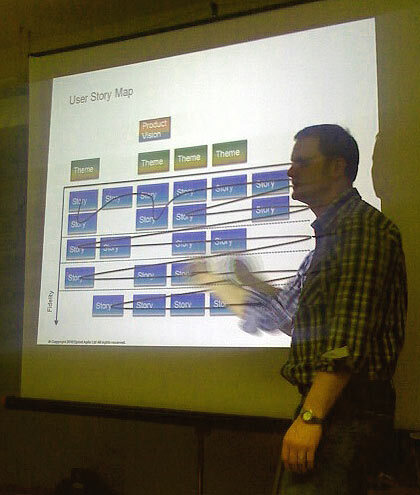 Further, next year (User Interaction Design MSc) I’m enrolled in a ‘Agile Methodology’ module at university (see below). My hunch is Agile methodology will gather further momentum and become more widely adopted in the future so I need to pay attention to it. Anyway, at last nights meeting Matt Roadnight, an Agile Scrum coach, explained how he coaches Agile Sprint methodology with business teams (his clients). Essentially there are three overlapping groups: Project Owner, Team Members and a ScrumMaster. Every project has what’s called a ‘Backlog’ – a set of items that must be designed/developed to progress the project. The project undergoes continuous flurries of meetings, or Sprints, where these backlog items (or groups of related and timely) items are discussed. Future items requiring attention are discussed in sprint planning meetings too. Matt went on to define roles and stressed the importance of collaboration and communicating amongst each other he defined responsibilities. The Project Owner – typically a senior stakeholder – is responsible for the Vision which includes strategy, business case, user experience research, as well as ROI. The Analyst is responsible for the Features and finally the User Experience Designer is responsible for the Experience. While the Analyst may be a stakeholder too, the UED is customer facing. I might add at this point that there was a little push back from the attendees arguing that user experience and features should not be seen as separate activities… they should validate against each other. The next Agile UX meeting (in ~6 weeks time) will include a practical hands on 2-hr session walking through a typical lifecycle of an Agile project. While still relatively new to the field of interaction design and all its associated family of off-shoots, I’ve found myself at a cross road of understanding. I’m looking for some clear thinking of what truly exists (of possible). The most frusting thing about the aforementioned assertions is it’s personally frustrating that I have no absolute stance. Let me continue and take a stab at it at this posts conclusion. I’m currently reading Alan Coopers’, The Inmates Are Running The Asylum, in which Cooper begins by arguing that in a world of products operated by computer chips, products are being designed that do exactly what their programmers instruct them to do with very little user empathy. From his writings I deduce Cooper implies that we need to do more ethnography so that products offer better support and function to its users. Where technology leads it seems difficult to achieve this. My view of product design and innovation is that before a new product is realised many hours of work goes into understanding what users need or what would help better fulfill a users tasks. Time is spent observing – through ethnography and other methods – users and how they interact with their surroundings. Also, a great deal of time is spent truly understanding exactly what the problems are. Answering the ‘why do we need it?’ questions. After reading Norman’s piece I can see that there are alternative instances where innovation stems from evolution alone (using technology). As the world moves through the technology age, more and more instances of ‘technology-first’ will become evident. My views are divided. I fully accept that new products (and services) are created by technologists first, especially nowaday’s for example in web applications, thus supporting Norman’s assertion. But, I also accept that there is a huge and essential role in understanding user needs that leads to innovative products development (and services). Often when I’m stuck or reach a road block – during projects – I turn to pen and paper to form sketches. Sketching allows me to draw from my minds eye into a temporary holding area (paper). Then when I have enough information I can then translate that view back into the poject. In May this year I wrote excitedly about an application to complete a Masters at UCL. Whilst I knew there was a good chance my application would be turned down I was hoping for a small miracle. Unfortunately I learnt soon afterwards that my application would be turned down. The reasons were never given, but to be fair to UCL I could have inquired myself. Due to disappointments at the time, I simply wanted to to move on. Four months later and I can report that my Kingston University application – for a MSC User Interaction Design – has been accepted. While the programme officially started in September I’ll be starting in January 2010. To say I’m happy would be an understatement. I’m ecstatic. Finally I can put a lot of what I’ve learnt (through passive and active self discovery) about designing great user experiences into formal practice – a systemic approach. You also cover a systematic approach to designing interaction – one that is explicit, knowledge based and creative – and various kinds of user interface technology. I’ve met my tutor via email and he’s prescribed a programme that should see me cover all the required modules in two years. The programme includes: Research Methods (1 & 2), User Factors, Experience Design (1 & 2), Usability Engineering plus three optional modules before concluding with a final project. So, it’s going to be a busy two years while I juggle a full-time job, a family, cycling with my Masters. I’ll be making necessary adjustments in my day-to-day schedule like dropping competitive cycle racing and reducing the amount of networking functions I attend whilst including necessary time to study. My priorities for the next two years are: Family, Work and MSc. I’ll be scheduling extra time to manage my studies, including: lunchtimes, evenings and weekends. I don’t often talk (blog) about personal opinions on global matters like Climate Change, but in the spirit of Blog Action Day and climate change on the agenda I thought I ought to. As the topic of climate change edges rapidly higher on everyone’s agenda it seems we can no longer avoid it or push the environmental snooze button. With marked increase in media attention, hype and all to frequent evidence of climatic catastrophes, the full consequence of our man-made actions are forcing conscientious people to pay attention. Focus and attention is no more obvious than right at our company – UBM. This is not an sucking up exercise to gain brownie points (or Wiki points for that matter), it’s merely something I’ve observed over the course of ~12 months. I love observing people, habits, cultures and adaptation from influence. I guess I can self-confess to being obsessive about observation and working out behavioural impacts and reasononings. Anyway, over the last two years I’ve noticed many changes in my immediate work space vacinity. Some of the changes are subtle some profound but overall I believe it’s making an impact albeit minuscule in the grand scheme of things. And its impact is not just at work but home too. Me – for committing time to write this post and present my obbservations (see below). Better optimised websites for print versions aimed at reducing uneccessary paper wastage. First exhibition to be awareded carbon neutral status in Europe. Environment awareness campaigns and better disposal monitoring. With our company’s collective effort we’ve managed to save a huge amount on wastage (tonnage) in 2009. These initiatives stand testiment to UBM’s committment to its corporate responsibility at protecting the environment in the fight against climate change. As part of the company-wide initiative our bloggers are supporting Blog Action Day (on Climate Change) so why not check out my colleagues’ post too. I’m not one for blogging about being social because I think it’s just human instinct that’s inherent within you or that you develop over time. However I was struck at just how much you do discover when you bring social into the mix. When I’m not at home enjoying time with my kids or at work I ride bicycles. I often ride to work commuting with all my work gear (laptop, clothing, books, etc) and at the weekend too. 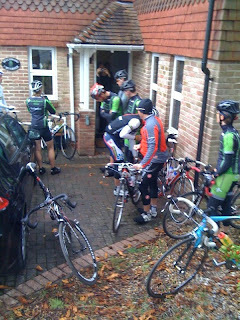 At the weekend I’m either racing or riding socially (or training to win races). Anyway enough about my riding, the point is whether on or off the bike I like spending time speaking with different folk. And it’s amazing what you can learn as I found out on my bike on Sunday. This weekend I was lucky enough to meet a guy (David Green) who was over to the UK on a short break. While cruising a gentle gradient on bikes I asked David what he got up to when not turning pedals? He went on to tell me he was an internet entrepreneur. “Wow!” I said, “… what sort of stuff are you involved in?” I curiously probed. Fifteen minutes later (and nearly involving a crash) he went on to tell me how in 2007 he was involved in a VoIP business that went bust and that he was now bringing content to cyclists in a ‘new – for the audience – digital format – an e-magazine publication. He procures local journalists (aka local riders and racers) to generate the content, either through writing, taking photos, tweeting or filming which he then collates and includes in a bi-weekly digital magazine, Florida Racing Magazine. It’s a really simple idea and very little risk and no (very little) associated production costs. Furthermore, the local contributors are more than happy to contribute (cyclists are vain) their content to the magazine to then see it distributed to a wider audience. For consumers there are not costs for them, they simply provide an email address and the magazine finds its way to their inbox. Better still, you could access the e-magazine directly from the website. The real weakness I can identify is the medium it’s distributed in… and that’s all. In a world where ‘content is king’ the only other issue is the level of appropriateness for its audience. Cyclists are tactile and like physical magazines. A field study of the said readers would surely reveal mountains of old magazines stacked to the ceiling in the bathrooms of cyclists’ across the country (I can confirm this). So what did a discover? Never underestimate the discovery power of being social no matter the context is. Keeping searching, probing, looking, asking… you’re sure to discover something that has meaning.